Personal FM receiver for the Motiva 360 system include earphones and environmental mic. Motiva is designed to mix and broadcast a speaker's voice PLUS an audio program, simultaneously, in one room. 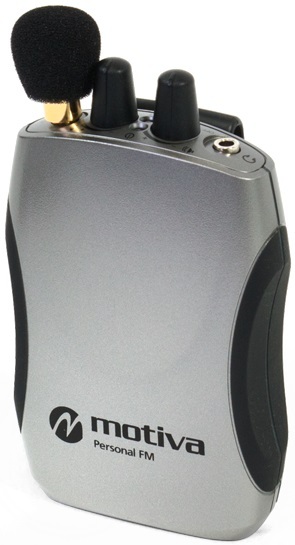 This sleek, lightweight system provides hearing assistance when background noise or distance from the sound source makes listening difficult. Motiva is ideal for small groups, classrooms, employee training and consultation.